We know parents are a patient lot, but that patience has been well and truly tested as we’ve waited and waited for the launch of ISOFix car restraints in this country. Well, here’s the update you’ve been waiting for! We asked our friends at InfaSecure what’s happening and good news, people – ISOFix infant car restraints will be on the Australian market later this year! They’re so thrilled that they got a bit creative and made this fun short movie to show you how fabulous it will be when ISOFix does get green lit. Take a look below (and see if you can spot some Babyology faces in the film), then read on to find out why we’re so excited. Now, the ISOFix seat in the video is a prototype, so it may not be what arrives in stores later this year. InfaSecure is still working to get the OK on the new Australian Standard from the ACCC, so specific details of design and even pricing can’t be released just yet. And we all know the wheels of government sometimes turn super slowly! But we’re told it will be very soon. ISOFix is not a magic wand when it comes to car safety; it is simply an alternate installation method that makes it easier to ensure a child restraint is fitted properly. You still need to make sure you choose the right restraint for your child, and that they always use it. 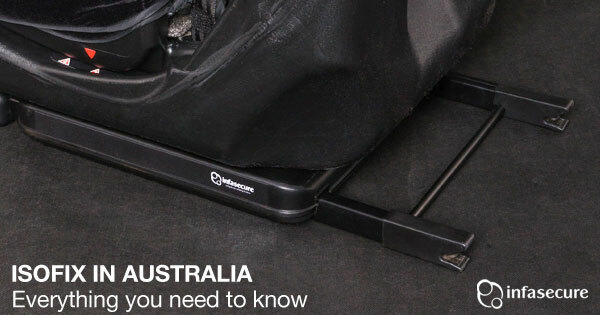 You’ll need to use a top tether strap for all ISOFix restraints fitted in Australia. ISOFix will only be available on rearward facing restraints and some forward facing restraints – booster seats for older children won’t be part of the ISOFix system. ISOFix child restraints from overseas will not be legal to use in Australia because they won’t have been certified to the Australian Standard. InfaSecure is not quite ready to talk about any specific products, timelines or prices just yet, but wanted to let Australian parents know that there are products in the pipeline and you won’t have to wait too much longer! To ensure you don’t miss out on the latest news, like the InfaSecure Facebook page or keep an eye on Babyology for the latest – you’ll hear it here first! We hope that clears up any questions you might have about where ISOFix is at. And trust us, as soon as there is any more news, we’ll fill you in. Until then, check out our comprehensive car safety guide for more car safety tips.